They are perfect for dressing up with many style, for special occasions,formal,casual,party,work,and perfect for any seasons. River island ladies shoes size 7/40 colour is on box beige-dark,and like a brushed suede material,I have never worn these,but I’ve tried them on obviously,and they’ve been tried on in the store,I need to accept that my feet are just too fat for these now. Condition is New with box. Dispatched with Royal Mail 2nd Class. River Island Ladies heeled Shoes Size 7. Dispatched with Royal Mail 2nd Class. ladies river island shoes size 7. Condition is Used. Dispatched with Royal Mail 2nd Class. River Island size 7 grey snake print. Only worn once! 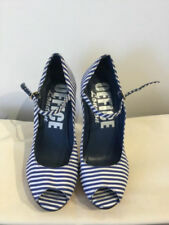 Green river island ladies shoes size 7. Condition is Used. Dispatched with Royal Mail 2nd Class. Black evening shoe, satin effect with silver and grey contrast stripe. Uppers:- no visible marks or scuffs. Backs of heels:- no visible marks or scuffs. Insoles:- no visible wear. The size printed on these shoes is :- UK 6 & EU 39. Very good clean condition. They have a lace tie up. See photos for examples. Matching bag available priced at £20.00. Brand New Never Worn Ladies Size 6 Ballet Pump Style Graceland Shoes by Deichmann, with striped pattern to outer edges and bar strap. Details: Two-part strap design with a peep toe, a slim adjustable strap to the sole and a chunky platform sole with a high wedge sole. Colour: Black & White. Size: UK6 EU39. Next Stripe Peep Toe Shoes. 1.5” Wedge Heel. Size UK 6 EU 39. Colour may not be exact as photos are affected by different light conditions and computer settings. Helen Bateman Edinburgh designer special occasion pink / lilac textile shoe 38.5 BNWOT, no box and a small (glue) textile defect on one heel. Adorable pair of US6 UK4 White and Black 'Groove' Striped Wedges. Size US6, UK4. It is a White with Black striped Wedge sandal with a cute bow and a comfy but quirky looking heel. 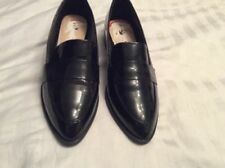 KG BY KURT GEIGER 'DANCER' SLIP ON SHOES UK SIZE 3. BLUE AND PINK STRIPED TEXTILE UPPERS. VERY MINOR USE ONLY AND BOXED WITH ORIGINAL £100 PRICE STILL ON. WE ARE LARGE ENOUGH TO COPE, BUT SMALL ENOUGH TO CARE. Style: Stripe Platform Wedge Heels. Colour: Blue & White Stripe. New ex display. Beautiful ladies babycham shoes size 7.used but in great condition.they are just abit too high for me.i have the box aswell. Ladies River Island Flats Shoes Size 7 in black Brand new Never worn Dispatched with Royal Mail 2nd Class.